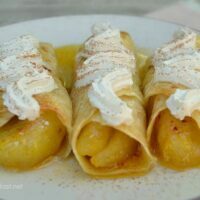 Cinnamon Apple Enchiladas are syrup drenched sweet treats, ideal to serve for dessert especially during Fall or Winter. 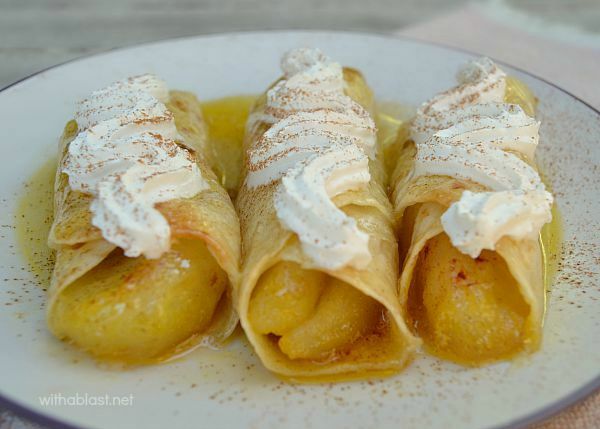 These Cinnamon Apple Enchiladas are delicious! Most definitely a dessert which will be served over and over again in our home. Soft, syrup drenched bottoms with a crisp baked top and even more syrup drizzled over after baking ! After baking, the tops of the Enchiladas were nice and crispy. I drizzled some of the sauce over and served it with loads of lightly sweetened whipped cream. This is a quick and easy recipe and no one will even suspect the prepping/baking and decorating took around 30 minutes. I used canned tart/pie apples – there is no liquid to drain, it’s all just packed with soft sliced pieces of apple. Mentioning this, as I used the same kind before and had a few readers asking me whether to drain the apples or not. Well, I have never used or seen cans of Tart Apples which needed to be drained in our usual stores. Therefore, if you do need to drain the kind you’re using, you will have to use larger cans or an extra can. As long as you have around 600 – 700 grams ( 1 1/2 pounds ) of apple pieces. 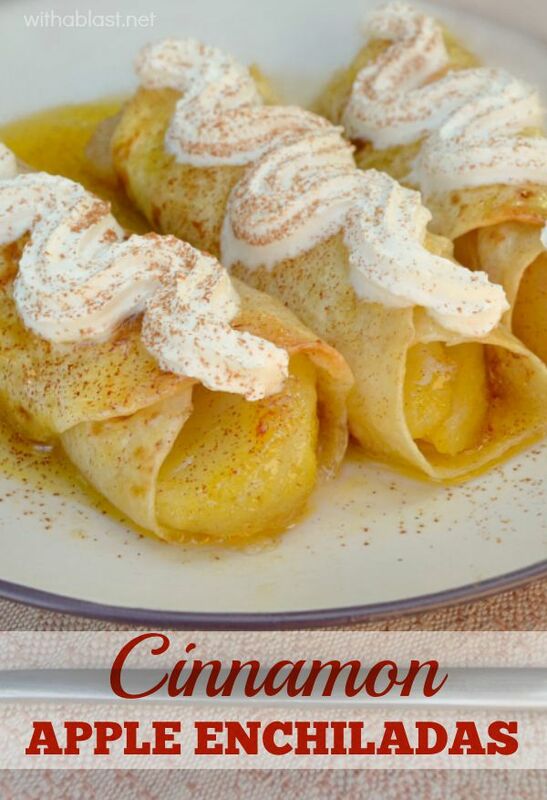 You also do not need to add Sugar to the Apples before rolling up, the Cinnamon will give enough flavor. Besides, the syrup provides all the sweetness you need for a totally decadent dessert. Serve with Whipped Cream and a dusting of extra Cinnamon. Enjoy – this is a keeper ! I have actually made something similar to this, they're fantastic! My friend Mary at Sweet Little Bluebird posted something similar to this and I made them! So delicious and so easy! And you know I'm sitting here with my morning coffee thinking about breakfast! These look and sound scrumptious! Thanks for sharing! YUM! I've been meaning to try this, but haven't done it yet…but I think I have all the ingredients – this might be the weekend! Ohhh I have never thought of making sweet enchiladas, what a great idea! These sound absolutely delicious!!! Hi Linda, I just stopped by from Dawn's party Swap and Share Sunday. I love this recipe, it's delicious and so easy to make and a fall favorite dessert. Yummy! I am hungry. Right now. Yum!!! Oh, goodness, these have me drooling at my desk! They sound so easy to make and are perfect for the fall. I've made similar things with eggroll wrappers but would love to try it out with tortillas. So smart! My appetite is coming back as I am wishing so much that I had this in front of me! Looks so-o-o good! What a fun dessert idea, Linda! I am so ready for Fall flavors 🙂 Pinned this! I made this last night but used fresh apples, sauteed with brown sugar, cinnamon, vanilla extract and a dash of lemon juice. It was amazing! I will definitely be making this again. Thank you for the recipe! I made this last night except I used fresh apples; sauteed the apples with brown sugar, cinnamon, vanilla extract and a dash of lemon juice. It was amazing! I will be making this again in the near future. Thank you so much for this recipe. Oh my word! These look so amazing. I mean what is not to love about ALL of these ingredients. I know what I am making very soon. Thank you so much for sharing and thank you for linking up to Thrifty Thursday. These look really yummy and the only thing I would do different is add MORE CREAM SPRAY ON THE TOP – OVER THE TOP!! YUM!! (Sharon) Delicious recipe thanks so much for sharing. You've been FEATURED at the BeBetsy BRAG ABOUT IT. Feel free to grab yourself a featured button or just link to the post. Our next party starts at midnight tonight… SO SEE YOU THERE! Hi Linda. Thanks for sharing at the Krafty Inspiration Thursday Link Party, you have been chosen as one of the top 5 featured posts at tomorrows party. Hi Linda, I have actually made these and they are delicious! Our family has tried different fruits. Apple and strawberry are our favorites! Thank you for sharing at our TGIF Link Party at A Peek Into My Paradise. I hope you will be back to link up another awesome post this week! OMG! These look SO good. I'm totally making these for my husband. What a fun idea! 😀 These look soo good! What kind of tortillas do I need corn or flour.